Moving down the list of apps to update, Advanced Advanced Find is up next. I’m a bit surprised. The app really doesn’t do much despite the name. I intended it more as a code sample. But if you guys want it, you got it. 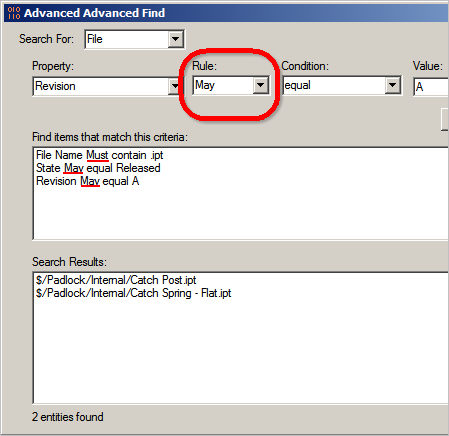 Here is the 2013 version of Advanced Advanced Find. If you are not familiar with the app, it’s a simplified version of the Advanced Find feature, but it allows for OR style searches. The Must rule is the default AND behavior. The May rule gives you new OR style behavior. Again, I didn’t have much time to add features. There is now support for Folder and Custom Object searches, but that’s it. Click here for the 2011 version. Sorry, there is no 2012 version. I indicated very clearly that my last post was a hack. I want to take a bit of time to explain exactly why it was a hack. I’ll also point out things that were not a hack. In theory, the hosting app and the plug-in are decoupled. But the reality is that they often are not. Unless an API provides specific support for this decoupling, you should assume a tight coupling. The Vault API makes no claims that you can load and run Job Handlers outside the context of Job Processor. If you’ve implemented a custom Job handler, you know that you have to edit JobProcessor.exe.config and add your own <jobHandler>. So the <jobHandler> syntax is spelled out right in the API documentation. Just because one job showed a single parameter, FileVersionId, doesn’t mean that all jobs of that type have the same single parameter. There may be optional parameters not shown. There may also be cases where certain files require additional parameters. Again, there is no way of knowing what those cases are. Without any official documentation, the best one can do is guess. This article is such a hack that I created a new category to mark the occasion. It goes without saying (but I’m going to say it anyway) that Autodesk isn’t going to provide support for what I’m about to say. In talking with people about various Vault customizations, I find that sometimes it would be useful to get at functionality provided by a job handler. For example, you want to create a DWF. Theoretically, it should be possible to call directly into the DWF create job handler, so I decided to play around a bit and see if I could get it working for real. Before I go into the details, let’s get abstract. Plug-in architectures usually follow the same pattern. There is the the hosting app, the plug-in and an interface connecting the two. Each side is not supposed to care about what’s on the other side of the interface. My test app takes advantage of that abstraction. The DWF handler, for example shouldn’t care if it’s running inside Job Processor or not. The handler just processes jobs. So all I need to do is pretend to be the job processor. I load the handler, create the DWF create job, pass it to the handler, and get a DWF file as a result.... in theory. The first step is to figure out which DLL to load. Looking at JobProcessor.exe.config, I see a bunch of <jobHandler> elements, which tell me which job types are handled by which classes. For this example, I decided to create DWF files. The .config file tells me that they are all handled by the class “Connectivity.Explorer.JobHandlerDwfPublish.InventorDwfJobHandler” in the assembly “Connectivity.Explorer.JobHandlerDwfPublish”. So let’s load Connectivity.Explorer.JobHandlerDwfPublish.dll using the System.Reflection libraries. Now I have the IJobHandler object, I need to pass in an IJob (which tells the handler which operation to run on which file) and an IJobProcessorServices (which provides context information). The IJobProcessorServices class was pretty easy to implement just by looking at the interface. For the IJob implementation, I needed to figure out what the parameter list was. I found this out by queuing up a DWF job from the Vault client. Then I used the API to see what the parameters were on the job. So did the app actually work? Yes and no. At first, my app was a stand-alone EXE. The app would always fail when running the Execute command. Remember how, in theory, the handler shouldn’t care about the hosting app? That’s not true for the DWF handler. It definitely cares about the app context and refuses to run if the environment hasn’t been initialized properly. My next attempt was to run it as a custom Vault Explorer command. The idea is that Vault Explorer will perform whatever operation is needed to make the job handler happy. My command actually worked. There is brief dialog that pops up and disappears during the Execute. But otherwise, it runs as expected. I have no idea if SyncProperties or UpdateRevisionBlock handlers will work with this hack. We are working on multiple fronts to address many of the Job Processor issues that people are running into. For this post, I want to point out some command line features we added to Vault 2013. This feature won’t fix all problems, but it has many uses. You can read about the command line options from the SDK documentation or the wiki. The idea behind these commands is to make JobProcessor behave more like a service. You can now programmatically start, pause, resume, and gracefully shutdown. Previously, start and kill were the only things you could do from a command line. Here are a couple of uses I came up with for these new command line operations. Feel free to post your ideas too in the comments section. When the CAD engineers go home for the night, use the idle computers to run Job Processor. Create a Windows task that starts up Job Processor at 8 PM and shuts it down at 5 AM, for example. If every CAD station does that every night, it should clear out any backups on the job queue. Maybe you would rather not process DWF files during the daytime. You can set things up so that DWF files only get processed at night. The first step is to copy JobProcessor.exe.config. Next edit the copy in an XML editor and comment out all the <jobHandler> elemets where the class attribute starts with “Autodesk.Vault.DWF.Create”. This config will will be the one you use when you don’t want to handle DWF files. Set up a Windows task that runs at 5 AM. The task will shut down Job Processor, swap in the non-DWF config file, then re-start Job Processor. Because the DWF <JobHandler> tags are commented out, it will not process DWF files. Set up another task at 8 PM to shut down Job Processor, swap in the original config file, then re-start. Here is an example BAT file for the 8 AM task.